LISA (Laser Interferometer Space Antenna) is an array of three NASA spacecraft flying 5 million kilometers apart in the shape of an equilateral triangle. The center of the triangle will be in the ecliptic plane one astronomical unit from the Sun and 20° behind Earth. The LISA mission, which is being designed at JPL (Jet Propulsion Laboratory), is intended to observe gravitational waves from galactic and extragalactic sources, including the supermassive black holes found in the centers of many galaxies. 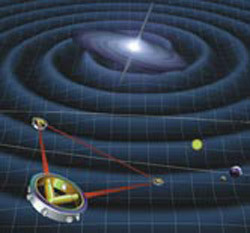 Gravitational waves are one of the fundamental building blocks of our theoretical picture of the universe but, although there is strong indirect evidence for their existence, they have not yet been directly detected. The LISA spacecraft, flying in formation, will be sensitive to the distortion of space caused by passing gravitational waves. Each spacecraft will contain two free-floating 'proof masses.' The proof masses will define optical paths 5 million kilometers long, with a 60° angle between them. Lasers in each spacecraft will be used to measure changes in the optical path lengths with a precision of 20 picometers (trillionths of a meter). LISA is expected to be launched in about 2018.